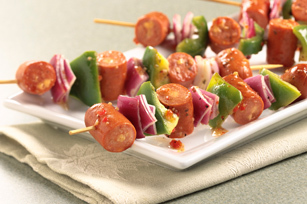 These no-grill kabobs are made with cheddar-stuffed beef franks, red pepper and green onion, then brushed with Italian dressing before going under the broiler. Thread franks and vegetables alternately onto 4 skewers. Place on rack of broiler pan. Brush with 2 Tbsp. dressing. Broil, 6 inches from heat, 8 to 10 min. or until franks are heated through, turning and brushing occasionally with remaining dressing. Heat grill to medium heat. Grill franks 7 to 9 min. or until heated through, turning occasionally. If using wooden skewers, soak them in water for at least 30 min. before threading ingredients onto them to prevent them from burning when cooking the kabobs. Save 40 calories and 4 grams of fat per serving by preparing with KRAFT Fat Free Zesty Italian Dressing.